Research published by finder.com.au predicts that Australians will spend $25 billion this Christmas. And the concern for many of us will be how to avoid Christmas debt hangover. Australian adults will spend $1325 each on travel, presents and alcohol, on average this Christmas period. The problems arise when the credit card bill is received in January. And the banks are smart in that they generally offer to waive the minimum payment in January. But most credit cards charge exorbitant interest rates for this privilege. 5% believed it would take more than one year to clear the debt. The problem for the five percent who take more than a year is that it will include another Christmas period. So, let’s work on an average spend of $1325 at, say, 15 percent interest for three months. That amounts to an extra $50 in interest. Multiply that by the number of adults in Australia and someone is making a lot of money! How can you avoid Christmas debt hangover? So what can you do to avoid Christmas debt hangover? Firstly, consider switching to zero percent purchase credit cards. These are readily available and may save you from excessive debt. Alternatively, make sure that you maximise the interest-free days offered by your existing card. Most of the cards offering 55-day interest-free periods come at a cost per year. A quick review on Canstar reveals that cards are available with an annual fee of $59, offering zero percent interest on purchase and balance transfers for six months; they then revert to 13.99 percent for purchases and a staggering 21.74 percent for transfers. Don’t wait for these interest rates to kick in. Another strategy to consider is setting a budget for Christmas spending. A Commonwealth Bank consumer spending study found that only 57 percent of Australians were planning to set a Christmas budget and nearly two-thirds of men were not planning to have a budget at all. The next issue is sticking to the budget. The CBA survey calculated that we will overspend the budget by $625 million this Christmas. One innovation that I’m seeing more of is the acceptance of Afterpay in retail outlets. It allows you to pay off your purchase over four equal instalments due every two weeks (which just happens to correspond to most employees’ pay cycles). Retail is struggling so outlets are looking for any advantage to attract consumer spend. The company makes its money from retailers paying for use of the service. Afterpay is simple to apply for on their website and easy to use: they provide an app to make payments for the product. But late payment fees, calculated at 25 percent of the purchase or $68 (whichever is less), can get you into trouble. Afterpay assesses your ability to make repayments after each purchase, so the more you spend the more you will be able to spend. And that could lead to further problems. The best idea? Avoid it… only buy what you can pay for now! 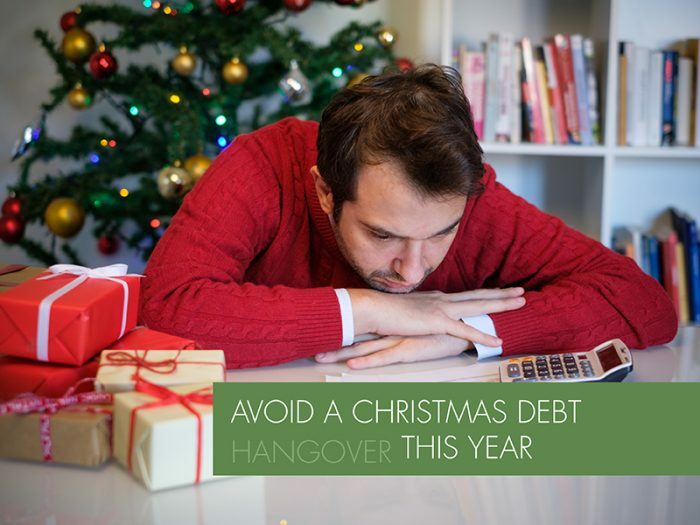 Whatever you do this festive season, enjoy the celebrations but try to avoid Christmas debt hangovers of any kind!